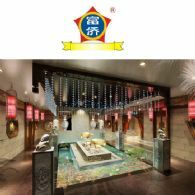 Traditional Therapy Clinics Limited (ASX:TTC) is a franchisor and the owner of one of the largest chains (by number of clinics) of traditional therapeutic health and wellness clinics in China. It currently has 343 franchised clinics and 35 owned clinics in operation. It is a well established business with a strong growth profile, employing a repeatable and scalable business model. 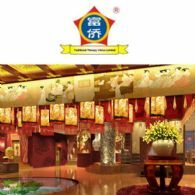 TTC has a highly recognised and respected brand, having received the prestigious Chinese Well-Known Trademark designation from the State Administration for Industry and Commerce. It operates within a strongly regulated industry sector of significant scale, which offers opportunity for further growth. Traditional Therapy Clinics Limited (ASX:TTC) is pleased to advise that the Company is making significant progress on building its first series of greenfield clinics. There are five greenfield clinics being established whereby three of them are located in Guizhou, one in Hanan and one in Inner Mongolia. The Directors present their report, together with the financial statements, on the consolidated entity consisting of Traditional Therapy Clinics Limited (ASX:TTC) and the entities it controlled at the end of, or during, the half-year ended 30 June 2017. Traditional Therapy Clinics Ltd (ASX:TTC) is pleased to announce the successful completion of the placement to sophisticated investors today to place a total of 5,700,000 ordinary shares in the Company for a total amount of $1,995,000 at a price of $0.35 per share. Traditional Therapy Clinics Ltd (ASX:TTC) is pleased to provide the Company&apos;s latest Presentation at AGM. Traditional Therapy Clinics Ltd (ASX:TTC) has successfully generated strong business and EBIT growth of more than 10% for its Chinese RMB operations since its IPO in 2015. This growth has been primarily generated by a careful expansion of both its franchised clinics and company owned clinics. Traditional Therapy Clinics Limited (ASX:TTC) advises investors that business continues as usual, and the Company is continuing to pursue its stated strategy to own more owner operated clinics, as well as diversify its service offering into the aged care sector, supplement by providing education for the healthcare industry. 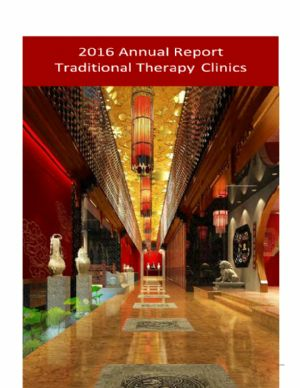 Traditional Therapy Clinics Ltd (ASX:TTC) is pleased to provide the Company&apos;s 2016 Annual Report to Shareholders. Traditional Therapy Clinics Ltd (ASX:TTC) is pleased to provide the Company&apos;s Preliminary Final Report for the year ended 31 December, 2016. Traditional Therapy Clinics Ltd (ASX:TTC) through its wholly owned subsidiary, Fuqiao Holdings Co. Limited, has entered into agreements to acquire three franchise clinics located in the city of Guiyang in Guizhou Province. Traditional Therapy Clinics Ltd (ASX:TTC) is pleased to announce the Company&apos;s Managing Director Zhirong Hu was elected as Council Member of China Association of Acupuncture-Moxibustion (CAAM). 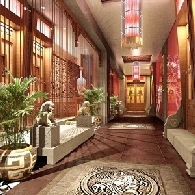 Traditional Therapy Clinics Ltd (ASX:TTC) is pleased to advise that following the receipt of full refund of RMB128 million previously paid by the Company for a previously contracted head office building, it has now proceeded to acquire a new head office building within Chongqing City&apos;s main financial district. Traditional Therapy Clinics Limited (ASX:TTC) is pleased to advise that it has received the fourth and final instalment of the head office building refund of RMB51.2 million from the building developer. 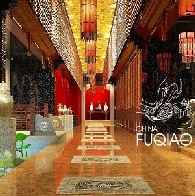 Traditional Therapy Clinics Limited (ASX:TTC) through its wholly owned subsidiary, Fuqiao (Chongqing) Holdings Co. Limited, has entered into a contract to acquire an additional clinic in line with a key element of the business strategy which is to grow its owned clinic network and increase revenues and profit. Traditional Therapy Clinics Limited (ASX:TTC) through its wholly owned subsidiary, Fuqiao (Chongqing) Holdings Co. Limited, has entered into a contract to acquire an additional clinic from its franchised clinic base in line with a key element of the business strategy which is to grow its owned clinic network and increase revenues and profit. Traditional Therapy Clinics Ltd (ASX:TTC) through its wholly owned subsidiary, Fuqiao (Chongqing) Holdings Co. Limited, has entered into a contract to acquire an additional clinic from its franchised clinic base in line with a key element of the business strategy which is to grow its owned clinic network and increase revenues and profit. Traditional Therapy Clinics Ltd (ASX:TTC) through its wholly owned subsidiary, Fuqiao (Chongqing) Holdings Co. Limited, has entered into contract to acquire a new clinic from its franchised clinic base in line with a key element of the business strategy which is to grow its owned clinic network and increase revenues and profit. Traditional Therapy Clinics Limited (ASX:TTC) is well positioned in the new five-year (2015-2020) China Healthcare Reform Plan announced recently. Traditional Therapy Clinics Ltd&apos;s (ASX:TTC) has been awarded RMB 1.0m by the Government under the Subsidies and Incentives Scheme of Chongqing Trademark Development following it having previously been recognised in China as a "China well known trademark". Traditional Therapy Clinics Ltd (ASX:TTC) is pleased to advise that it has received the third instalment of the Head Office building refund of RMB38.4 million from the building developer. The Traditional Therapy Clinics Ltd (ASX:TTC) Directors present their report, together with the financial statements, on the consolidated entity consisting of Traditional Therapy Clinics Limited and the entities it controlled at the end of, or during, the half-year ended 30 June 2016. Traditional Therapy Clinics Limited (ASX:TTC) (the Company or TTC) is pleased to announce the appointment of Mr Peter Wong as its Chief Financial Officer effective immediately. The Board of Traditional Therapy Clinics Limited (ASX:TTC) is pleased to announce the appointment of Mr Geoffrey Ross and Mr Christian Drysdale as non-executive directors. Welcome to the first Annual General Meeting of Traditional Therapy Clinics Limited (ASX:TTC) following the successful completion of our Initial Public Offering and listing on the ASX on 3 September 2015. Traditional Therapy Clinics Limited (ASX:TTC) through its wholly owned subsidiary, Fuqiao (Chongqing) Holdings Co. Limited, has entered into contracts to acquire a further three (3) clinics from its franchised clinic base in line with its business strategy. 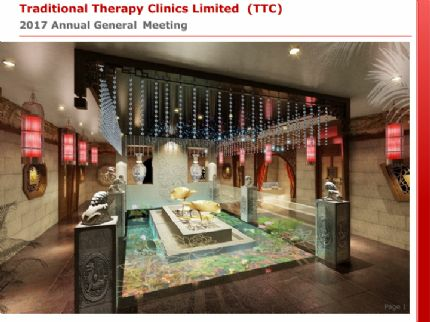 Traditional Therapy Clinics Limited (ASX:TTC) outlined in its Replacement Prospectus (dated 30 June 2015) that it was constructing a new head office facility in Chongqing, China, which was due to be handed over at completion, expected to be on or before 31 December 2015. Traditional Therapy Clinics Limited (ASX:TTC) advises that Mr Zhonghan (John) Wu has resigned as its Chief Financial Officer, effective 17 March 2016 and that the Board has accepted his resignation. Traditional Therapy Clinics Ltd (ASX:TTC) (TTC) Annual Report to shareholders. During its maiden year as a listed company, we are pleased to report that TTC delivered both business and earnings growth strategies set at the time of the IPO. Traditional Therapy Clinic Ltd (ASX:TTC), owner of the largest (by number) of health and wellness clinics throughout China, has today lodged its Appendix 4E (Preliminary Final Results) with the ASX for the period ended 31 December 2015. Traditional Therapy Clinics Limited (ASX:TTC) has entered into contracts to acquire a further four clinics from its franchised clinic base in line with its business strategy to grow its owned clinic network and diversify its revenue stream. Traditional Therapy Clinics Ltd (ASX:TTC) Investor Presentation. Please find in link below, an investor presentation that will be given by the Chairman and Chief Financial Officer to investors over the course of the next two weeks. Traditional Therapy Clinics Limited (ASX:TTC) has entered into contracts to acquire four clinics from its franchised clinic base in line with its business strategy to grow its owned clinic network and diversify its revenue stream.